comments: I plan to study Turf Management in College. What would some of the best 2 and 4 years colleges be. I also would like to know if you know anything about the Professional Golfers College I an interested in attending that school. I would like to learn how to teach people to play golf. I feel that it would be very interesting to become a golf instructor. Some of the best Turf Management Schools are Penn State University and Texas A&M University. These are the two schools where most new grasses and studies are presently coming from. Overall, there are a few Universities that offer the Professional Golf Management (PGM) program like New Mexico State, Ferris State in Michigan and Mississippi State. 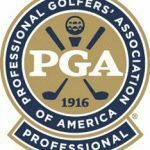 For more information on that program, contact the PGA of America at www:/http:/pgaonline.com and ask for information on these schools and the PGM program. comments: Who would I go to for information about going to Q-school in the future? 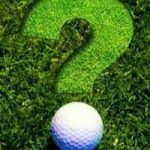 Can you tell me anything about getting information on college golf scholarships? When you are ready, write or call the PGA Tour office in Florida for information on Tour School. Getting a golf scholarship can take some investigative work. Find some schools you would be interested in attending. Call and find the name of the golf coach. 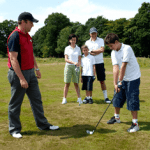 Write or call and make contact with the coach and inform him of your Junior golf accomplishments. A lot of college recruiting is done nowadays on the American Junior Golf Tour (AJGA). Call them at 770-998-4653 about getting into some of their tournaments. The best way of all for a men’s scholarship is to play a lot in school and summer, post good scores and finishes in tournaments and the scholarship will come looking for you. comments: I have a few questions. I kind have trouble playing from the sand. I normally get too much sand and leave the ball in the bunker and sometimes I blade it out. Are there any tips you can give me? Also, I am not a very long hitter, I can hit the ball accurately but not long. Are there any tips you can give me on that? Finally I wanted to know if a 23 handicap for 12 year old is real good, okay, or awful. Thanks! Great questions! First that 23 depends a little on how long you have been playing. There are some 12 year olds that have been playing 5-8 years and have much lower handicaps. Some aren’t able to shoot better than 110. I would say that 12 and mid 90’s is doing quite adequate and hard work, lots of play and a few lessons from one of those great PGA Instructors in the Houston area will bring that handicap down QUICK! As to your questions. Too much sand and short distances with long shots are related. Mostly it means you are swinging the club too up and down and not enough around your body. Work on trying to make your divot in the sand thinner by trying to make your swing more “U” shaped instead of the “V” shape it sounds like it is. When you start hitting bunker shots with thinner, shallower and longer divots, you will find that you are going to be hitting the ball farther with your other clubs too. Pressure before a match comes from where you are focused. When you focus on the future (the playing of the match) or the outcome (the results of the match) you can really get yourself feeling pressure. That is not to say you don’t set a game plan for your round. After you have set your game plan, write it down and put it in your bag. When you arrive at the golf course and from that moment forward, stay in the present! That means to pay attention to the task at hand. Hitting practice balls, hit each on with a purpose only concentrating on that shot. Same thing on the putting green. Take that to the golf course and focus on each shot as it comes, forget the last one, stay away from projecting to your score for the hole or for the round! Simply put, golf is a lot like life. Get stuck in the past or look too forward to the future and you miss all the fun and joy of the present. Life and golf is not about the results. It is all about the process. Let go of pressure? Focus on the process. Hitting one shot at a time, executing each shot to the best of your ability at that moment in your round and in your life. Let go of outcomes and you let go of the fear of “shooting the score.” Let go of that fear and then think hard and find where pressure is. You won’t find it. Practice this part of playing this great game as hard as you practice hitting practice shots. It becomes even more important as you become a better player. Best of luck. Stay focused when you need to (only over the shot) and only on what you need to (the process, not the outcome).